Gayot Fow, Hi, Please would you add something from your experienced eyes to my queries below. Thanks. Thanks for your time for reading my post. 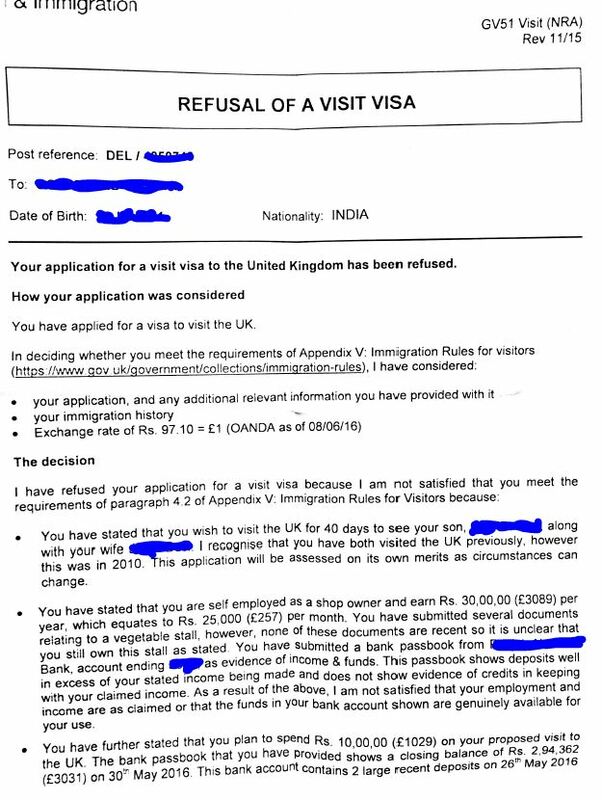 I made a mistakes in filing application forms for my parents 6 months visit visa without realising and as a result got a real heartbroken refusal. Because of some silly mistakes their passport is now saddled with a refusal. Refusal letter is attached here for your expert views/feedback. A little background on my case. I have recently(April2016) naturalised as a British citizen through Tier 2 general route. I am a permanent employee and earn GBP 40,000 from my job. My parents have visited us here in Aug 2010 when our first child was born. At that time in 2010 we used similar set of documents we have used this time and they got their visa within 4-5 days. Since their refusal I’ve been going through the Internet to understand what mistakes we made. To date amongst other websites I’ve found this Forum is one of the best source for guidance and help. After going through several old posts here I can now see what major mistakes I made on my parents applications. The biggest one of them was a huge sum of transfer into parents account by my sister just 2 days before and NOT attaching any letter for explanation of it whatsoever. Also, in the application form we stated that the cost of this trip would be GBP 1000, but didn’t clearly specify that this is the cost for 2-way tickets for both of them rather than just for 1 person. I did enclose sponsorship letter in which I confirmed that I will bear all expenses incurred by my parents during their stay in the UK and for their travel. My father is a self-employed shop owner and his shop is on rent which gives them steady income. My mother is a housewife but receives rental income, she’s registered owner of the house and have land registry in her name. The house they currently resides in has three floors and the top floor is on a rent to a relative (rent is received in cash and sometimes may get deposited in their bank account). The house worth at least GBP 200,000. The shop my father owns has a market value worth at least GBP100,000. They don't have any intentions of living in the UK for longer than a month or two at a stretch, all their friends and family relatives are in India, they are also not very comfortable in speaking English. The only reason they want to come to the UK this time is to spend some time with our two little ones in our new house. In the refusal letter ECO didn’t mention anything about my mother’s finances, they copied & pasted same reason on her refusal letter. We did submit her Income Tax return and she’s a joint account holder for the bank account for which the passbook was submitted. To reapply again I understand our documentation has to be solid with clear explanations of my parents circumstances without any ambiguity. 1. We are thinking of getting a valuation done on my parents properties for the shop & house and use it to demonstrate that they have strong ties in India. Will it help? 2. Secondly, attach a letter written by my sister to confirm that she has given gift to my parents for a large sum, this will be supported by her bank statements. 3. I did write a sponsorship letter which I’ll do it again to bear their living and accommodation expenses here. Could someone point to a template please if there is one? 4. Also, I’m thinking of drawing up a family tree chart which shows that I’m the only family they have here and everyone else is in India, this to demonstrate that they have more social life in India. 5. Is it advisable to change some basic facts in their application forms eg. In my mother’s form can we now say that she’s a housewife and not show rental income from the house, the reason is because she doesn’t have a rent agreement in place and her bank records do not substantiate this claim. Although her annual Income Tax returns are based on this rental income. TBH I’m really not comfortable with the fact that we hide this. Is there anything else we could do? Could experts please give us some guidance here, we would be really grateful. Could experts answer my 5 queries please? sorry, and add whatever they feel I might have missed. The reason I request is that I don't want my parents to have another refusal due to something which is avoidable. Much appreciate your time. I cannot think of anything other than all those things you've already listed. As Long as the stated grounds for refusal are addressed, more likely than not your parents should be granted visas the next time. Above all, explain in a letter the large sum of Money your parents got. Not the answer you're looking for? Browse other questions tagged visas uk visa-refusals proof-of-funds or ask your own question. 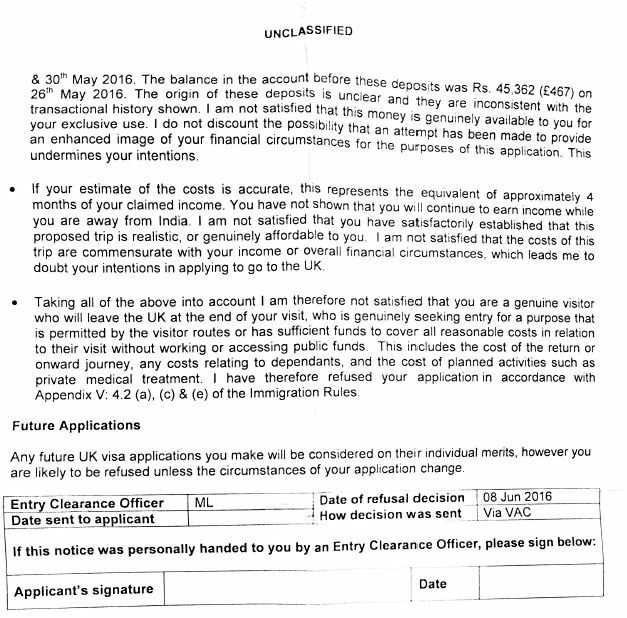 UK general visitor visa refused for funds evidence?